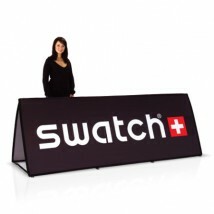 For fast and effective portable branding at al fresco events, outdoor pop up banner frames are hard to beat. 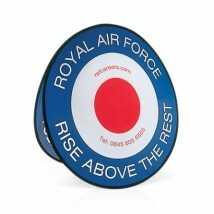 Available in a range of shapes and sizes to suit your exact requirements, the banners feature a strong and robust fibreglass frame which can be custom designed and printed to display your logo, company name or latest promotional message in vivid colour with clear text that is easy to read even from a distance. 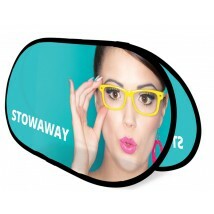 Our range includes round and oval pop up banners, along with both vertical and horizontal pop up banner designs. Tough and weatherproof, the pop out banners feature high strength textile fabric that is suitable for use in all types of weather conditions, and display a high quality print on both sides of the frame to ensure it catches plenty of attention from any direction. 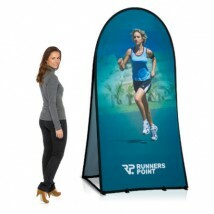 Perfect for golf days, sporting events, outdoor trade shows, festivals, corporate days, showrooms and forecourts among many other uses, the portable pop up banner frames can be displayed in driving rain or wind when they are anchored to soft ground with convenient pegs. However, the versatile banners are equally suitable for indoor use, making them easily reusable, as an additional part of any exhibition, open day, expo or trade show kit, or even for use in reception areas or meeting venues. The ultra-lightweight pop up banners can be constructed in seconds without any tools or expertise required, and they fold flat into a convenient carry bag for transportation and storage when not in use. The clever compact designs are perfect for getting your message across, creating a huge visual impact and grabbing attention at events where you have limited space. High quality, full colour bespoke printing is included in the price of each of our double sided pop up display banner frames. How much is a pop up banner? What is the size of a pull up banner?